While some balked at the high price of the Apple iPhone when it was released last year, others deemed the cost of owning the mobile phone acceptable. But would they feel the same way if their iPhone cost a whopping €120,000 (₤94,000)? Austrian designer and jeweller Peter Aloisson has made a name for himself as a designer of many OTT designer gadgets. 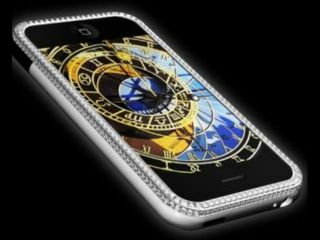 He has created an iPhone that's not only the most expensive of its kind in the world, but is packed with 318 "Princess" diamonds. Dubbed the Princess Plus, the very high-end iPhone sports the familiar 8GB iPhone chassis, but is made of 18-carat white gold and sports 318 Princess-cut diamonds with a total weight of about 17 carats. And of course, at that price, all the diamonds are flawless and colourless, creating a more appealing experience "when consumers hold the mobile phone in their hands for the first time". The Princess Plus is available now and must be activated once purchased. And if iPhones aren't your thing, Aloisson also offers Nokia, Motorola and other blinged-out mobile phones.